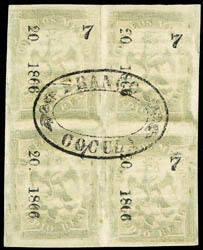 Mexico, 1866, Eagle (5th Period), ½r gray, Guadalajara, without district overprint, cons 20-1866, sub 7, block of 4, central oval Cocula cancel (Schatzkes 370), large margins, Very Fine and choice, only 300 sent, used blocks of this stamp are very rare; with 1983 Jaretzky certificate. Scott No. 20d var. Estimate $600 - 800. 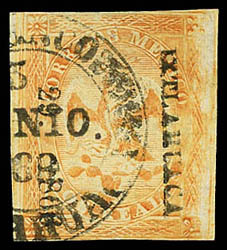 Mexico, 1866, Eagle (5th Period), 2r orange, Ixtlahuaca, cons 29-1866, 1866 Ixtlahuaca circular date stamp cancel (Schatzkes 594), wide margins, Very Fine, very scarce with only 169 sent; with 1999 M.E.P.S.I. certificate. Scott No. 23 Estimate $400 - 600. 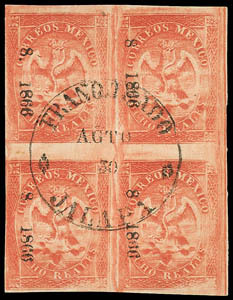 Mexico, 1866, Eagle (5th Period), 2r orange, Queretaro, cons 4-1866, sub 7, horizontal strip of 3, on piece with complete strike of negative Acambaro oval cancel (Schatzkes 1273), ample to large margins, Extremely Fine, a showpiece, with only 100 sent. 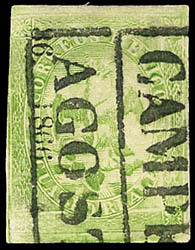 Mexico, 1866, Eagle (5th Period), 4r green, Campeche, without district overprint, cons 35-1866, bold Campeche boxed date stamp cancel (Schatzkes 57), Very Fine, with 309 sent. 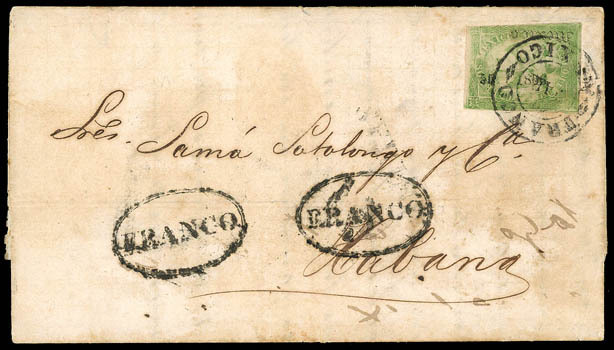 Mexico, 1866, Eagle (5th Period), 4r green., Mexico, cons 55-1866, tied by Mexico handstamp (Schatzkes 821) on 1866 folded letter to Havana, Cuba, with two strikes of "Franco" in oval handstamps struck upon arrival; some light cover aging, F.-V.F., an extremely scarce usage to Cuba, ex-Rosenthal. Scott No. 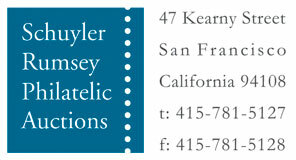 24 Estimate $1,000 - 1,500. Mexico, 1866, Eagle (5th Period), 8r red, Jalapa, without district overprint, cons 8-1866, block of 4, central Jalapa circular date stamp cancel (Schatzkes 596), Very Fine, remainder cancel but a very beautiful multiple, with 400 sent. Scott No. 25 Estimate $500 - 750.